I love chocolate and mint together. 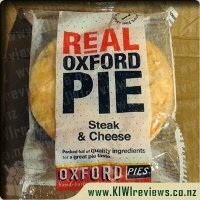 It&apos;s such a delicious flavour combination. When I saw that these truffles came in mint and chocolate flavour I had to get my hands on them. 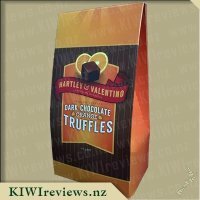 While my husband was out for an evening recently, I was sitting watching TV and I thought, why not open these truffles. I figured I would have one or two and that would make up for me not being out with him. I opened the little packet and the smell of creamy mint and milk chocolate hit. It smelt so good, my mouth was watering almost immediately. I bit into the first truffle and that creaminess followed through to the smooth texture and the taste. It was so delicious. I savoured that first truffle, eating it slowly and definitely went back for the second. I held off having anymore that evening. The next night I thought about the truffles, he was out again. The kids were in bed and I sneaked another one. Again, it was mind-blowingly good. I promised myself I would share with the kids and the husband and stopped at one. The next occasion, they were unfortunately either out or asleep. Are you noticing a pattern? 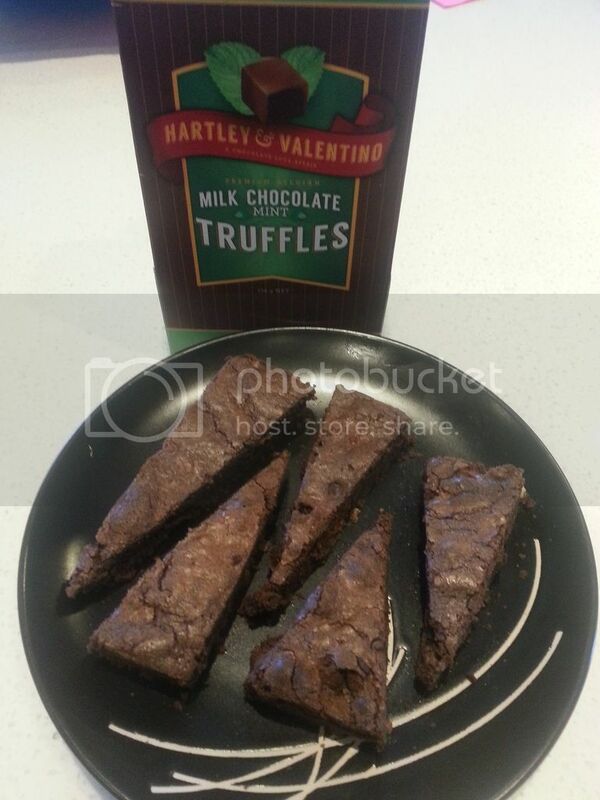 Eventually I &apos;remembered&apos; that I had the truffles and I cut one up for the kids to try. My youngest thought it was so good, but my eldest thought the mint flavour was a bit too hot. I also shared with my husband and he was torn. His favourite has been the orange, but the mint is better in my opinion. I think he thought it was as good too. The other night I offered him a mint or orange. He went for orange, but he stared at my mint truffle for quite some time. I suspect that I will be needing to replace this box as soon as I can. I&apos;m a huge lover of mint chocolate so decided to request a packet of these delicious sounding chocolates to try. Luckily for me, these delightful little treats couldn&apos;t have arrived at a better time. They arrived a few days before my birthday so I got to indulge on them with no guilt at all! I did manage to share a couple with my husband but kept them out of reach from the children, I just thought the quality of them would be wasted on the smaller people in my house and I wanted to keep some for other family members and friends to try. The taste was amazing. The milk chocolate around the outside was solid but not too hard and the inside was utter perfection, so soft and smooth. My husband thought they were "damn good" too. 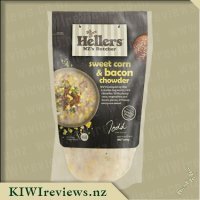 I bought some around to a family gathering and let my family try them and everyone who did try one loved it and wanted to know what other flavours it came in. I love how classy these chocolates look both in the box and in the individual packets. The little packets on their own would make a fantastic addition to some mini Christmas hampers I&apos;m creating and I know they&apos;ll go down a treat with the teachers at my kid&apos;s school and daycare, I&apos;m going to have to buy another box just for this purpose. 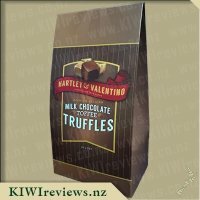 I would really like to search for the other flavours and try them too, if they are anything like the mint truffles then they are something I definitely don&apos;t want to miss out on. 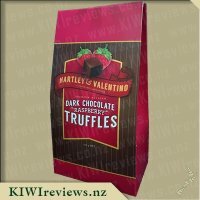 All in all, these are my new favourite treat but at the price of $12 for 10 chocs they are definitely in the upper end, price and taste alike. Truffles aren&apos;t a product that I usually buy myself, however at Christmas time I do love to make homemade truffles of various different flavours to give as gifts. 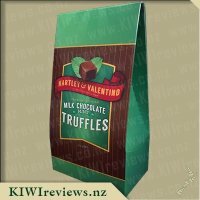 When I saw these yummy sounding truffles up for review they sounded like something well worth trying, as I know many people who love the combination of mint and chocolate after all these 2 flavours do go together hand in hand. When I received the box of truffles my initial thought was &apos;these would be perfect to pop into a gift hamper&apos; as the box to me was of a great size, upon opening the box up and taking a peek inside I was even happier to see that the truffles were each individually wrapped in a beautiful metallic green plastic which would look just lovely scattered in a gift basket, even better than they would look left in the box. 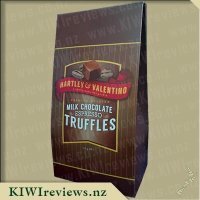 The box was easy to open by simply pulling the sticky seal of the lid, and the individual truffles also proved to be a breeze to open with a perforated edging to them which was easy to tear, even my 3 year old had no problems getting into these! I counted 10 truffles in my box and although at first I felt that this wasn&apos;t very many after my first taste I was satisfied that 1 was enough, and the size was generous for such an item. The smell of the mint was strong and hit me as soon as I tore open my packet. The flavour was delectable the chocolate truffle centre had a fresh, not overpowering taste of mint which was lovely and smooth just like how I would expect a truffle to be, melt-in-your-mouth like, and the chocolate shell coating was thick and just right with a nice bite to it. I offered these to my partner and mint loving family members who all raved about them, my mother in law even said they were better than a after dinner mint, and she is a huge after dinner mint fan. 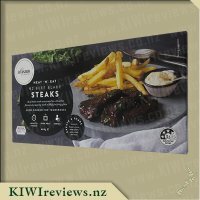 My work colleague was lucky enough to sample one and was a huge fan and was happy to know that these can easily be ordered online, as like me she thought they would be great to add to a Christmas hamper. With 3 lovely little morsels left I decided to chop them into small pieces and add them to a chocolate brownie I was making. These added a lovely mint flavour to the brownies and only 3 truffles seemed to go a long way, the truffles melted but you could certainly taste them. 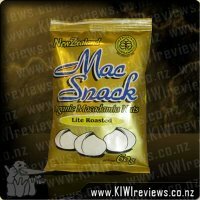 Such a yummy treat which I am so happy I had the opportunity to try, I know these are a product which in the next few weeks I will be purchasing again. Truffles are an item that I&apos;ve never really had the opportunity to eat too often. Generally it&apos;s a decadent luxury item that never seemed to appeal as I get plenty of enjoyment from a king size bar of generic Cadbury of Whittakers chocolate. But I saw these up for review so I decided to satisfy my minimal curiosity while the opportunity was there. 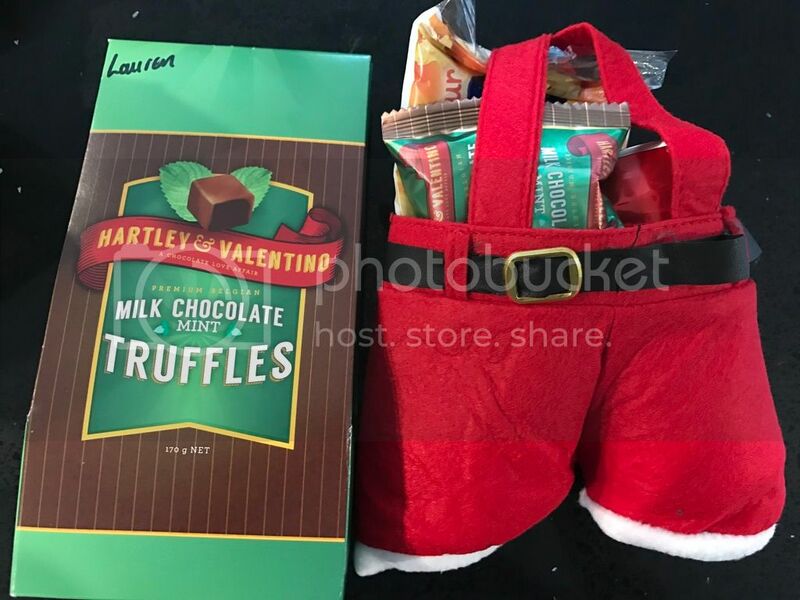 The truffles came enclosed within foil wrappers, themselves held within cardboard packaging, so a lot of packaging, which I&apos;m never too happy with. I like to try limit the amount of garbage that I create. But there is obviously a reason for the packaging. Preserving the freshness for longer, as a single truffle counts as a serving (approximately 98 calories per 15 grams of truffle). Despite the packet specifying 17g per truffle, I figure they are slightly smaller both packets of truffles that I received contained 11 truffles, rather than the specified 10 servings per pack (I assume they are packed by weight rather than count). 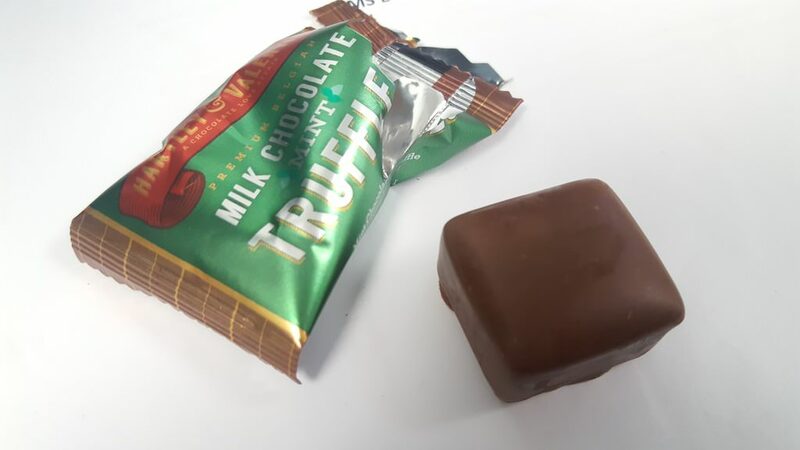 Getting an extra truffle is never a bad, thing though it kind of balanced out this time, as one of the packs was slightly torn; some may see that as reason enough to throw it out, but I&apos;ve got a pretty solid stomach. 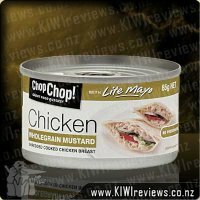 The second reason that the extra packaging is good is purely for greater portion control. Taking a bite out of the truffle, there are two main textures; a thick nougat-like truffle encased in a soft milk chocolate shell. I say soft, because picking it up, or putting it down, it leaves chocolate behind on anything it touches. The truffle itself is quite smooth, and not as rich as the &apos;Chocolate Raspberry" variety. This smoothness makes it easy to eat and I could easily find myself chowing down on multiple servings in one sitting. 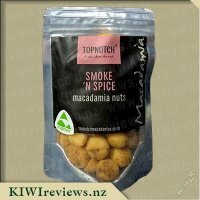 The mint flavour is enjoyable, and you can smell it as soon as you open the packet. I would have loved to have this as a "Dark Chocolate Mint" truffle, and dark chocolate and mint is pretty much my favourite sweet combination. But very much an enjoyable treat anyway. 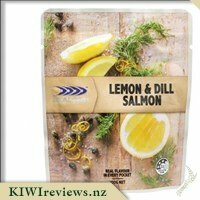 At $12 a packet, it looks pretty expensive, but you are looking at $1.20 per serving (or less if you got 11 like I did), which is a great price if you can stop yourself at one serving. OH MY GOD, where have these been all my life? 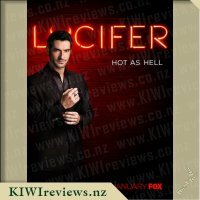 I came home from work the other day to find a parcel waiting for me, and this was one of the review things in it. I thought the box looked pretty good in real life, as stylish as the picture on the site really. Very professional and stylish which made me think the chocs were going to be something pretty special. Yeah, they were, eh. So smooth and creamy, melt in your mouth things they were. All individually wrapped so they were ready to be shared around. A bit on the pricy side but they are imported and seriously fancy chocs alright so the price is understandable. The choccies were amazing, with a creamy soft centre wrapped in a milk choc case. I wanted it to be dark choc to be honest because that would have set off against some of the sweetness, but its good that it wasn&apos;t because I a pretty sure I would have eaten the entire box in one short stretch eh. hahaha. When I was given these, I was asked to see if I could think of a use that was a bit outside the box, but I am sorry to say that after trying the first one the only use I could think of for these outside of the box was "take them out of the box, and eat them." 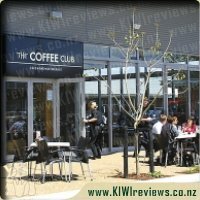 They really are just that good. Sure to be a big hit at the family gatherings, in Christmas presents and all that jazz, you gotta go buy some! 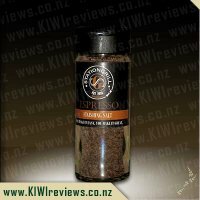 In Italy salt is placed in espresso to enhance the coffee flavour. We have fused this tradition and created a finishing salt to compliment both sweet and savoury cuisine. 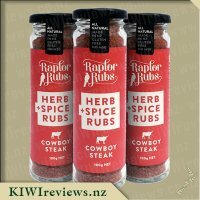 USES: Sprinkle on beef or game meat to create a smokey aroma that coffee is famous for. Sprinkle over ice-cream or desserts to balance sugar.